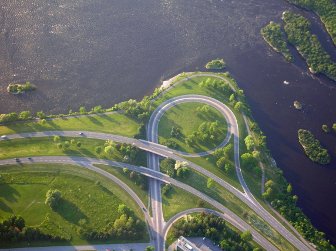 An interchange is the intersection of two highways at different levels with separate connecting roads for the transfer of traffic from one highway to the other through a series of ramps. The connecting ramps allow drivers to leave on road and enter another safely, without impeding the flow of traffic. 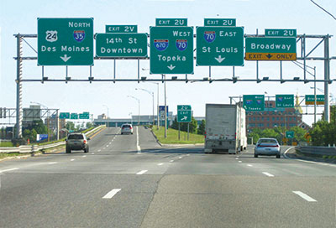 While there is a large number of different interchange types, based on their configuration, four most common interchanges can be singled out: directional, trumpet, cloverleaf and diamond. The method of turning at interchanges may vary:make sure to slow down and observe road signs that will provide directions about how to make the turn. A single-point interchange compresses two intersections into a single intersection controlled by a single set of traffic lights. A directional interchange is placed at an intersection of two highways where a high volume of traffic desires to transfer between only two legs of the interchange. 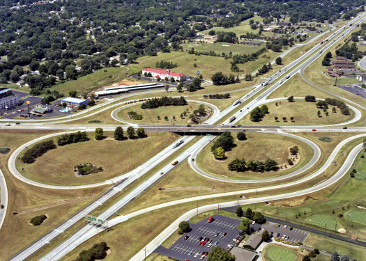 Directional interchanges have increased ramp speed and capacity and require less space, when compared to a conventional cloverleaf interchange, but they are more costly to construct due to an increased number of ramps. Probably the most common highway interchange out there. Cloverleaf interchange is designed to allow drivers to make turns off and onto the highway from four directions using loop ramps. Loop ramps safely accommodate left turns and eliminates all cross traffic conflicts. Two main disadvantages of the cloverleaf interchange design are the need for more space and longer travel distance for the left-turning traffic. 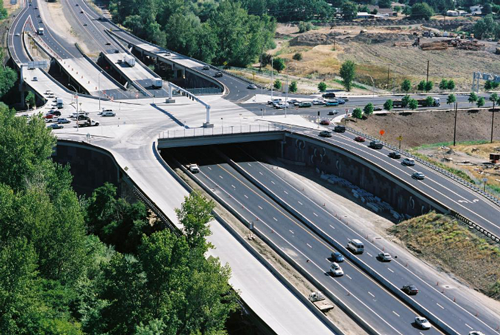 However, cloverleaf interchanges are significantly cheaper than directional interchanges and are ideal for rural areas. 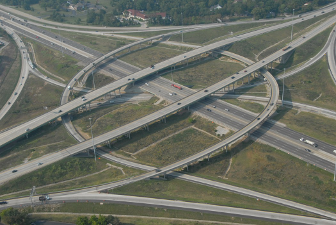 Diamond interchange design is utilized when a busy freeway intersects with a lesser road. Traffic leaves and enters the highway through four ramps. Left turns are made after leaving the highway. 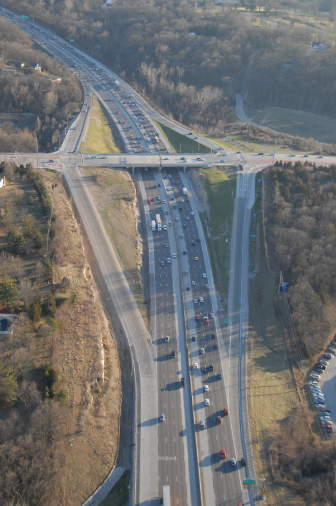 Due to the limitations in design, an increase in the volume of traffic on the crossroad leads to congestion and increased waiting time for traffic leaving the highway. A trumpet interchange may be used instead of a T-intersection when one highway terminates into another highway. A trumpet interchange may be seen as a combination of a directional and a diamond-shaped interchange. 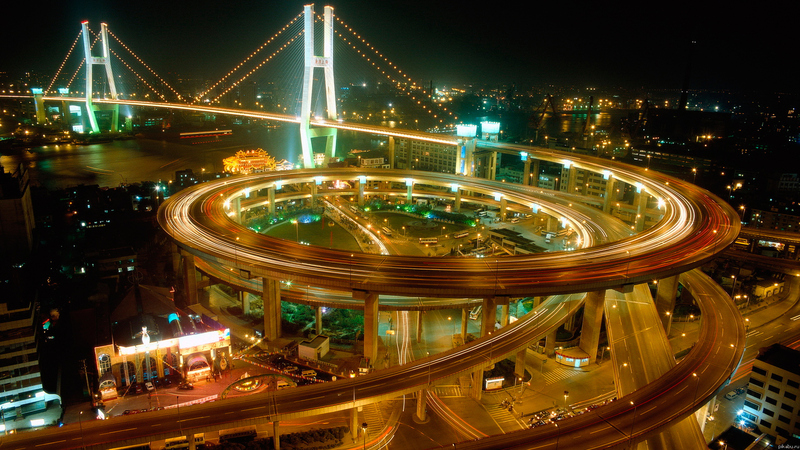 A single point urban interchange is a traffic signal-controlled diamond-shaped interchange. Through traffic, traffic turning left or off the interchange is controlled by a single set of traffic signals that are located at the top of the interchange. The design is utilized at busy interchanges with limited space available, it's main advantage is that it allows opposing left turns to proceed simultaneously. In order to assist drivers with navigating complex interchanges, green guide signs are installed on approaches and directly at the interchange. Individual guide signs may be installed above separate lanes to let drivers traveling in the lane know their options. 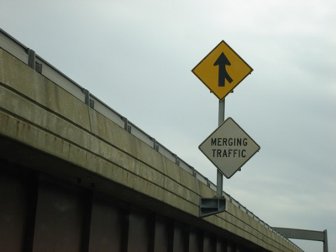 Additional warning signs, such as MERGING TRAFFIC , ADDED LANE or WEAVE AREA may be installed to warn drivers about traffic that may be merging onto the highway. While vehicles already traveling on the highway have the right-of-way, you should still exercise caution when you see these highway warning signs near an interchange.